Karl and I celebrated our first wedding anniversary on Saturday. I bought him a house; he bought me renovations. I think that’s what we’ll be giving each other for quite a few holidays to come. For his birthday, I think he gets windows. Or maybe plumbing. I’m romantic like that. 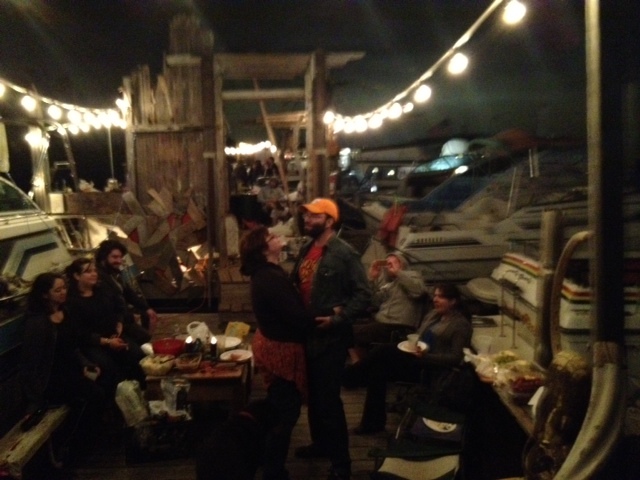 Either way, it was a very different celebration than our wedding reception, which was held with a few of our closest friends at Boatel in the Rockaways. There were old yachts, updated by artists, lots of Jameson (Maker’s Mark; I stand corrected), costumes and probably a few bed bugs. We had a great, drunken time. This year, we met with our contractor who gave us the news: choose windows or mechanicals (i.e. plumbing, electrical and heat). You know, #firstworldproblems. It seems that our first $100,000 just doesn’t quite stretch as far as we’d hoped. We can get the demo done, some small-but-necessary stuff, the rough framing and either windows or mechanicals, but not both. I hadn’t counted on the framing. Rookie mistake. I thought, well, that’s all interior, it can wait; we’re not doing much anyway. But because the back porch/addition has to come off, all of that framing on the south wall has to be completed. And while they are in there, they have to update the framing to meet current fire codes. So my $26,000 I’d hoped to spend on window is now going to framing. Le sigh. After much deliberation, Karl and I decided to go with option b: windows. I know, that sounds like crazy has taken over. Windows before plumbing, wtf? But you see, nobody will even look at us for a loan or insurance if we don’t have windows. Before we can even talk to them about our credit blemishes (Karl, still looking for work; my ugly foreclosure from my divorce), they get stymied on the lack of windows. This is Detroit, I plead. Nothing has windows when you buy it. Most of the city is boarded up. No sympathy there. None of the banks are really equipped to handle these kinds of projects, which is shocking. We’re not Star Trek here. This is not “to go where no man has gone before.” We’re not the first couple to embark on this wacky dream. So I assumed the banks — at least local banks — we’re prepared for the challenges and quirks of the market. (You know what they say when you assume….) And insurers, well don’t even get me started there. No is the word of the day. What that means is that we prioritized windows because it gets us closer to insurance and a possible loan. Plus, these windows have a four-to-six-week lead time for manufacturing. You can’t just walk down to Home Depot and pick out some vinyl-clad beauties. Nope, these have to be approved by the Historic Commission, and that comes with a hefty pricetag. Have I mentioned that it will be about $44,000 just to put glass in Matilda? Yeah, I about fell over, too. So, to bury the lede, this is what it really means: Unless we can come up with about another $40,000 in the coming weeks, we will have to move in without running water or electricity. We will truly be urban camping — but with style: two dogs, two cats and one grand piano. Everyone keeps saying this will be an adventure. I think lack of water definitely counts. Still, I must wish a happy anniversary to my Lovey. We’re in this together, and that’s what counts. We can celebrate big when we get electricity. You know, by charging our iPhones and watching some Amazon Prime.